Apple on Tuesday unveiled two thinner and larger screened smartphones, the iPhone 6 and the iPhone 6-Plus, as it looks to fend off competition from Korean handset maker Samsung. Also, after years of rumours and speculation, Apple unveiled its first wearable device, Apple Watch. The smartphones and the smartwatch were launched at the Flint Centre in Cupertino, California, where the iconic Macintosh was first launched 30 years ago. The current iPhone 5S is retailing in India at about Rs. 41,500 for the 16GB version. “These are the new iPhones. The iPhone 6 and iPhone 6 Plus. These are the best phones we have ever done,” he added. 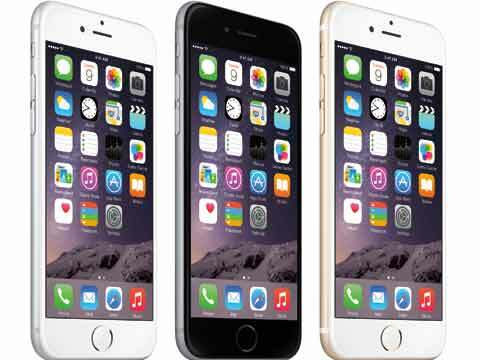 The iPhone 6 features a 4.7-inch display, while the iPhone 6 Plus has a 5.5 inch screen. Compared to a thickness of 7.6 mm of iPhone 5S, the sixth generation has a thickness of 6.9 mm (iPhone 6) and 7.1 mm (iPhone 6 Plus), respectively. “These iPhones obviously have bigger displays, but more importantly, they’re amazing products in every single way,” Cook said. The devices feature Apple-designed A8 chips, which have 25 per cent faster processing power and up to 50 per cent faster graphics. The handsets feature 8MP iSight camera and support Voice over LTE. The iPhone 6 also has improved face detection for selfies and group selfies. For the fitness freaks, iPhone 6 has a barometer that senses air pressure to measure relative elevation. The iPhone can now tell if the user is going up molehills, mountains, etc. The iconic creator of iPods and iPads also announced its foray into payments with Apple Pay. “Apple Pay will work with the three major payment networks: American Express, MasterCard, and Visa. Apple Pay will be available in the US in October 2014. And work is underway to take it worldwide in the near future,” Cook said. With Apple Pay, users will be able to check out with one tap, making purchasing through apps easier, more secure, and private. Merchants like Target, Groupon are already on board, with others like Disney, Chipotle, and MLB.com coming in by the end of the year. The Apple Watch sports a flat screen with sapphire glass and has a ‘digital crown’ with a twisting control that lets the user scroll through different functions. It runs apps, takes dictation and interacts with the iPhone. “With the Digital Crown, you can scroll, zoom, and navigate Apple Watch without covering the display,” Apple said. The watch has a gyroscope and an accelerometer that measures fitness. Besides, it uses the GPS and Wi-Fi in the users’ iPhone to help track the distance. It comes with colorful wrist bands (pink, blue and white) and styles like hand-crafted gold buckle. The smartwatch has three variants - Apple Watch, Apple Watch Sport, and Apple Watch Edition, which is made from 18-karat gold. According to research firm IDC, Samsung is the market leader with 25.2 per cent share of the global smartphone market, followed by Apple (11.9 per cent) and Huawei (6.9 per cent) in the second quarter of 2014. A total of 295.3 million smartphones were shipped in the April-June 2014 quarter, up 23.1 per cent from 240 million in the same period last year.